Regency uniquely provides Earth First recyclable packaging. 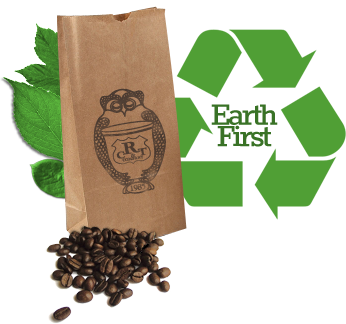 The coffee packaging bags are made from 40% natural unbleached kraft paper and 25% post-consumer paper. The bag is lined with Earth First a compostable film made from Ingeo polymer which is made from annually renewable plants. Regency continues to seek out, environmentally responsible products for our clients. Regency takes great pride in being environmentally friendly!